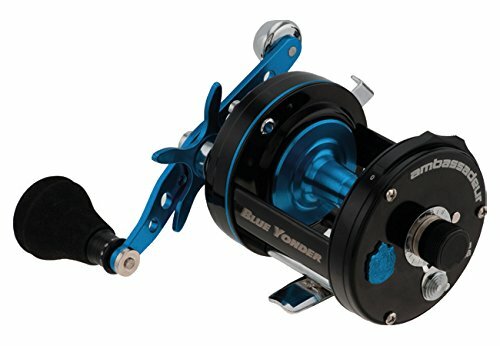 The legendary Ambassadeur 6500 Blue Yonder casting machine is back, featuring an open CT frame for maximum grip when long distance surf casting. On-the-fly casting control is achieved with an externally adjustable MagTraxTM brake system that delivers consistent brake pressure throughout the cast. An extended bend handle with power knob gives anglers an edge by increasing torque and aligning the cranking hand closer to the reel for more efficient fighting power.2 stainless steel ball bearings + 1 roller bearing provides smooth operation. DuragearTM brass gear for extended gear life. Open CT frame for easy line access. Carbon MatrixTM drag system provides smooth, consistent drag pressure across the entire drag range. MagTraxTM brake system gives consistent brake pressure throughout the cast. Extended bent handle with power knobs for increased cranking power.